I love when people who are originally from Kyrgyzstan or Kazakhstan write comments on my blog! They are authentic and informative. What a surprise for me to read a comment made on a blog I posted years ago about Kazakh carpets. Similar to this intensive labor of love, I am having informed ladies from my northwestern Minnesota community come and talk about the hard labors of making quilts at our Carnegie library in October. We will feature antique quilts that were made over a century ago, some are crazy quilts. But nothing compares to the back breaking work of creating a beautifully colored Kazakh or Kyrgyz carpet. 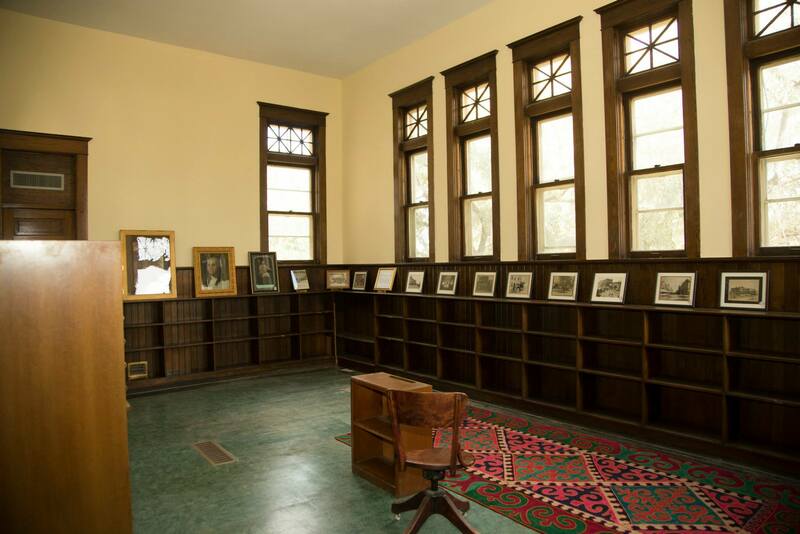 I’m glad I have my Krygyz one that I bought 20 years ago and brought back to the U.S. and now featured in our old Carnegie library. “I am from the south of Kazakhstan. We used to make all kinds of rugs when I was growing up in my aul (small Kazakh settlement). The last time I took part in making a rug was 1984, just before I left my aul at age 17. Making a rug is a hard work. Weaving an average size kilem of 2.5×3.5 meters four girls takes minimum one month, working from dawn to midnight. Apart from four women weaving the kilem, it is also a hard work for a host lady feeding these girls well four times a day. So this is only the weaving process. I’m extremely excited about this recently released book by Summertime Publishing for expat readers to learn more about Kazakshtan. I contributed a story in the second chapter of six chapters for this book. I’m awaiting my copy to come in the mail from the Italian editor, Monica Neboli. You can check it out for yourself by going to Amazon.com. In the 196 pages, there are over 20 authors who have also added their experiences to this book. The chapters are the following: 1) The Arrival 2) Kazakhstan’s History and Traditions 3) Contemporary Living in Kazakhstan 4) Cross-Cultural Exchanges 5) Travelling in Kazakshtan 6) The Silent Steppe. After reading the first chapter’s entry by Jacyntha England about “First Snow,” I was brought to tears. Ms. England does a good job of showing how the Kazakh people are kind and giving. That’s what I want to remember about the many Kazakhs I met in Almaty and Astana the three and a half years I lived in Kazakhstan. In this case, they welcome the vulnerable visitor who doesn’t know how tough the country can be especially with the first snow of the season. The empathy shown by an old man acting as a taxi driver to a woman who has just arrived from a two week vacation in Thailand is endearing. The warming blanket is the key ingredient in this story. Please check this book out for yourself if you want to learn how other authors portray this well kept secret of a country…Kazakhstan. In Drinking Camel’s Milk in the Yurt, we travel to the country’s bustling, multicultural cities, to its rural homesteads steeped in rich traditions, and to the Kazakh Steppe, the vast open plain that has for centuries been home to a nomadic way of life. During the journey, we come to understand the importance of the yurt, or nomad’s tent, we are privy to a powerful reflection on Soviet-era labour camps, and we witness the build-up to a traditional Kazakh wedding. In a variety of cross-cultural exchanges – some bewildering, some funny – we meet locals, try new cuisines, discover the work of a talented local artist, join one man’s quest for a unique piece of Kazakh furniture for his wife, and explore the steppe as it deserves to be explored – on horseback. More importantly, we are introduced to the warmth of Kazakh hospitality and we learn it is possible to survive the extreme temperatures of a Kazakh winter. 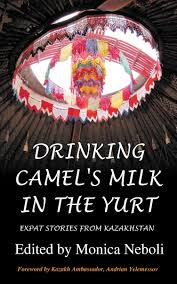 Whether you are an expat, a traveller or just curious about other cultures, Drinking Camel’s Milk in the Yurt: Expat Stories from Kazakhstan will introduce you to the Kazakh landscape, people and cultures as experienced by its expatriates – both those who are passing through and those who have decided to stay.